This week, I talked to Claudia Saenz, founder of the Chulita Vinyl Club. This collective regularly plays music that a lot of readers of this column love: rancheras, corridos, cumbias and all types of Tejano and conjunto music. The Chulita Vinyl Club had their first show here in the summer of 2015, and returned again in the spring of 2016. This year this collective of DJs returns to Yerberia Cultura for a special night that includes the Austin group teaming up with the local RGV group for one night of great jams. Eduardo Martinez: To people that aren’t familiar yet with Chulita Vinyl Club, what should they know about it? 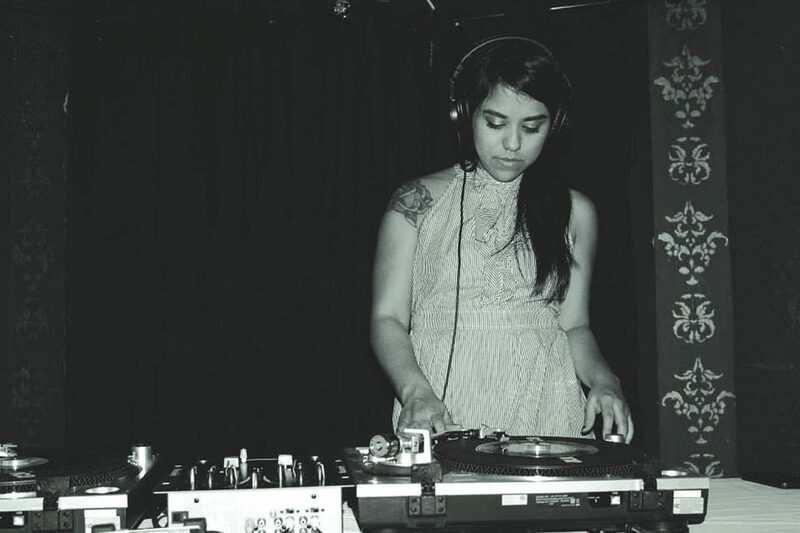 Claudia Saenz: Chulita Vinyl Club is an all-girl, all-vinyl DJ collective. It’s basically a gathering of vinyl loving girls that are out sharing their records out in the public. We have seven chapters across Texas and California. It originally started in Austin, Texas, and then we extended on to San Antonio, to the RGV, to California, the Bay Area, Los Angeles, San Diego, and Santa Ana chapters. Also, at the same time, we are skill sharing. We show each other how to DJ, we bond with each other, we inspire and create together. EM: What are some different ways that Chulita Vinyl Club has grown in the last few years, since it was first launched? CS: The biggest way is the size, we’ve definitely grown in size. We started in Austin, and then the interest grew so big, so much that I just felt there was need to expand, to grow, to create different chapters. It’s grown and we’ve become very organized. It’s a lot of work but we’ve become very organized in getting shows together, making our own events, and also collaborating with other DJ collectives in the local scenes. And also become more active with our communities. We’ve become more active and more familiar with our communities, as far as in the arts, and music. EM: Last time I saw you here was at the Dreams event in March at Yerberia Cultura. What did you think about that festival? CS: Oh yeah, that was a blast! I was really happy that I was in town for it. First of all, Yerberia Cultura, I’m so happy that it exists. I’m always like, “Man, I wish it would have existed when I was young and when I was a teenager living in the RGV.” I think it’s a beautiful space that was definitely, definitely needed for people in the RGV, in the creative arts to get together. To have a space, a hub, to get together and create and inspire one another. Specifically Dreams, I really enjoyed it. I was really happy to see Xenia Rubinos, Downtown Boys, it was a blast, I had a good time. I can’t wait to see the line-up for next year, and I’m also excited for Galax Z Fair coming up. EM: Do your Valley roots show up when you are DJ’ing over there in California and other places outside the Valley? CS: Oh yeah, I make it a point to represent and [pay] homage to the RGV. For the RGV, I bring out a lot of Ramon Ayala, and a lot of conjuntos that are from the RGV, or the norte, the northern Mexico region. In San Francisco, I played Los Relámpagos del Norte, the song “Idos de la Mente.” It’s a really slow ballad, but that’s kind of style of music, anyways. That was a couple of months ago, and I was so proud, so happy to play that for the crowd. EM: So can you tell us about this Friday night at Yerberia Cultura, and who will be DJ’ing? CS: So it’s going to be a couple of girls from CVC Austin… Xochi Solis, she’s the lead Austin organizer (for Chulita Vinyl Club), so she’s definitely going to come, along with a couple of other girls from Austin. As far the RGV, it’s going to be Monica Rios and Rebecca Rodriguez. They are all going to be rotating, all playing their different records up there (on the stage). I’m excited for them but sad I won’t be there. But I’m excited and Yerberia Cultura is just the perfect place to do have this.